Source: I checked this book out at my library. Reader Gut Reaction: What if you met your doppelganger? Someone who looks just like you, just walking around on the street? Will Grayson of Evanston, Illinois doesn't quite meet his doppelganger, but he meets...another Will Grayson, of Naperville, Illinois. They don't look like each other, and really, they aren't much alike at all, even below the surface—but that doesn't mean they won't make a difference in each other's lives. I thought this was a very cool premise, and the dual-author (dueling author?) 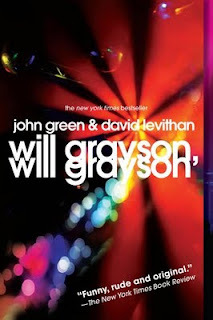 collaborative nature of the book made each voice distinct and kept me on my toes as a reader, trying to guess how each Will Grayson would ultimately affect the other. Concerning Character: The two Will Graysons are well-drawn, distinct characters with very different lives and motivations. Will Grayson #1 (I'm calling him that simply because he's the one who kicks off the story) is cool, controlled Alterna-Dude, into indie rock and going to concerts and hanging out as the somewhat drab sidekick to his gay best friend, Tiny Cooper—football player and theater geek extraordinaire. Will Grayson #2 is troubled, angry, depressed, and emotionally stretched almost to the breaking point. Both Will Graysons, though, are lonely, and have trouble reaching out and having fulfilling friendships, let alone romantic relationships. What's more, Will Grayson #2 is (EXTREMELY MINOR SPOILERS) gay, and has no idea how to deal with it. I really enjoyed reading about both characters' journeys, both separately and after they meet. My only thought was that Will Grayson #2's change of heart seemed to happen so quickly for such a dramatic change...I found him almost painfully unlikeable at the beginning, and so I was a little skeptical when he starting becoming a more empathetic person. Nevertheless, the process of change for both Wills—and their respective opening up to (and acceptance of) the risks and rewards of life—was ultimately satisfying. Themes & Things: It's interesting to me how many of John Green's books are, in some way, about journeying to meet your destiny: An Abundance of Katherines, Paper Towns--and this one, too, even if the journey only takes each Will into the heart of Chicago. This story also plays a lot with the idea of coincidence. In particular, it raises the speculation that there's a fine line between coincidence and fate, because of what we make of the seemingly random things that happen to us. Also, this book portrays the complexity of identity as a gay teenager—and the difficulties, as well as how those difficulties intertwine with the the challenges of coming of age that arise independent of sexual orientation. Both Will Graysons face the sorts of complications that come along with learning to accept yourself—and others—warts and all. You can find Will Grayson, Will Grayson at an independent bookstore near you! Have you heard? Today kicks off the 3rd annual Guys Lit Wire Book Fair, this year for Ballou Sr. High School in Washington, D.C. Go check out the video, check out the story, and go buy books for a great cause! Book Fair Winds Down--Have You Donated Yet? "You Know, I Wish They'd Get Over Me." Support Mental Health: Grab a Book!